I am very new to this site and wish I would've known about it before to share and hear stories of other chows. I joined to post info to all chow lovers and owners so you will be aware of a fatal condition not widely publicized called "bloat" that affects all dogs and killed our beloved Chow. It is the number 2 killer of dogs after cancer. Sometimes people come home to find their healthy companion dead and can not figure out why except for their distended stomach. My family is heartbroken because we lost our very special friend Cheena this 4th of July weekend to bloat. She went on walks, chased our cats and had the happiest demeanor of any chow chow we had in our family before her. She had been acting tired, unlike herself lately and we attributed it to the heat and her age. She had began to hide under workdesks in the garage and would have occasional sad/aloof moods. We figured she was just becoming more "chow". Fireworks are legal where we live and this was her least favorite time of the year. After dinner on Sunday, she began panting very heavily and hunching up like she wanted to vomit but nothing came up. We took her inside to keep her away from the firework noise but she could not sit still and would stand in one place hunching up and pacing throughout the house. She couldn't stay in or out. We figured she wanted private time. That night we heard noises and went outside to find her shutting down. She was not responding to light and had began to foam. Immediately we took her to the animal hospital. They turned her away and we went to another one and by then she had died on the road. They diagnosed it as bloat. Bloat happens when the stomach flips and cuts off the esophagus. (imagine a balloon being twisted and pinched to make balloon animals) It needs to be treated immediately as it can be fatal in a matter of hours. I am still doing research on this but want to share some things we've learned. Do not feed your dog one/two hours before or after exercise: it can create gas. Make sure your chow has a stress free eating place; don't tease or make scary noises while they snack. Cut very dry food with meat juices. Too dry food that doubles in size when wet expands in the doggies stomach and causes gas. Feed 2/3 times a day rather than one big meal. Table scraps are ok, but watch out for citric acids in dry fod. There are a lot of other tips available online, some conflicting but all informative. Bloat does not discriminate by breed or age. Just think of how you gassy you get when you eat too much or have to work out after eating, not fun. Apply the same rules to your chow and watch for any different behavior. Cheena must've had the condition for a long time and just cured herself. Watch out for personality changes, when they seek out hiding places and the inability to vomit. These are all indications that they are susceptible to bloat and talk to your vet about procedure (anatacid tablets) in case they get a strong attack like the one Cheena died from. Please talk to your vet and do as much research to educate yourself and others about thsi condition as it is sudden and traumatic to families who love their dogs. If we would've known the symptoms and what an attack looked like, Cheena would still be napping on her bench waiting for us to come home so she could play. I am so sorry for your loss. I am sure she is over the rainbow bridge playing and having fun, though that is smal comfort to you right now. Honey, my 14-1/2 year old chow, was 12 when she got bloat for the first (and so far, only!!) time. I had taken her to the vet for shots and grooming (lion summer cut for the heat down here) When I got there, she was having a hard time walking, and I thought she had put on a few pounds over the past year that I hadn't noticed because of her coat. When I got her home, she was extremely lethargic, but wanted to go outside, so I let her. I kept checking on her, because I didn't like the way she was acting. Her legs kepts collapsing under her, and she seemed to be getting bigger by the minute. I called the vet's emergency service and was frantic. I thought she had had a stroke! He had me bring her in right away, examined her and said he thought she had bloat. I assisted as he put what looked to be the size of an oversized garden hose into her intestines. Within SECONDS, she was back to her normal size. She recovered completely, thank god. I am very sorry for your loss of Cheena, I know exactly what you're feeling because I just lost my 11 year old chow chow this morning to that torturous condition. I will give you a brief run down of the events yesterday that led up to Mack's death this morning, then I'll give you my opinion and feel free to give me your's. Also please note that this has happened to Mack once before for about 3 hours when he was 6 years old. I remember him throwing up and he was fine after doing that. Yesterday Mack was fed one can of chicken and rice mush food around 9-10:00am. I gave him a treat or two throughout the day and played with him running around the backyard until he got tired. Then at 8:00pm I gave him his daily walk. At around 10:00pm we gave him another can of same food. I would say about 5-10 minutes we noticed his behavior change and his stomach bloating. We let him in the backyard to sort it out because while I was in the backyard yesterday, I saw him eating grass which I know can induce vomiting for him to "clean out his stomach." The bloating got worse and I could see he was trying to throw up repeatedly but he couldn't for some reason. We let him back inside the house at about 11:00pm where we figured he would still work it out as he's done before. At 1:00am we noticed him passing gas frequently, giving us the idea that we were right and his stomach had decreased in size noticeably. So we fell asleep and woke up at 4:00am with him passing more gas and realized his stomach was bigger than before. We took him to the 24 hour vet where they gave us the options of putting a tube down his throat to clean out his stomach ($1,500), or doing surgery to fix everything ($3,000+). The vet said that his stomach basically twisted in half like a balloon and the blood vessels were kinked like a garden hose, so basically his stomach was going to die first. At 8:00am the doctor was really pushing for the surgery saying that it was the best choice for survival and I knew she was right, but I'm 25 years old and really didn't want to go back into debt again, I still have two more years left at my university and it's not going to be cheap. At 9:15am we found out that his blood was too dirty from dead cells from his dieing stomach so now we had no choice but to put him down. The surgeon doesn't arrive at the animal hospital until 10:00am anyways. My own opinion to anyone who is experiencing this with their chow is to GET THEM TO THROW UP WHATEVER IS IN THERE STOMACH. I'm convinced that if I had gotten the food that was fed to Mack around 9:00pm out of his stomach when he first started showing problems around 9:00pm, he'd still be alive. I tried doing this around 4:00am but he was already out of it and was trying to stop me by closing his mouth and not opening it. It was his body reaction stopping me. Also I found online this morning that there are dog bowls that have islands in them designed to slow down the eating of big dogs, it's a shame I wasn't aware of those... Anyways I hope this helps you or anyone else in this situation. Sorry to hear it. One of my chows had bloat and I took him to the 24 hour vet. I heard a loud belch then little toe nails on the floor as my puppy came running out into the lobby. They stuck a hose down his throat and charged me $200.00. All was good after that. Wow, Eric, I don't know what to say to you. You opted against life-saving treatment and instead just watched your dog die? And no, there is no home-made "Getting the dog to vomit" bloat remedy. The faster you arrive at the vet's and start treatment, the better. Sorry for your loss, but oh my God! my pup [ 15]has never had that, but was wondering about pills like gasx? GET THEM TO THROW UP WHATEVER IS IN THERE STOMACH. I don't know how you really arrive at that summary, because bloat can also be caused by gastric torsion and no amount of throwing up is going to change the physical ramifications of torsion. Only surgery can correct this and there is little or no time to waste in having it done. I can tell you it is a most painful death for any animal, and I can't believe that someone would just sit back and watch it happen. If a dog is bloating it needs to get to a vet without delay, no matter what. Chow 315 - w hen a dog bloats they are beyond gasx or beeno or any other product like that. They need immediate medical attention. There are some dogs who because of the physical location of their stomachs will be prone to bloat no matter what they are fed. Sometimes this is a conformation thing, not a food thing. There are some breeds, like bloodhounds and great danes who have their stomachs "tacked" as part of their care, just to help avoid this very dilemma. The condition bloat is called torsion. I experienced this with my 6 year old chow chow Chuffy. Luckily we were home when it happened. If you are not home, they probably won't make it. The stomach twists inside, cuts off circulation and begins to die. The food that is in the stomach continues to digest, is trapped and bloats. The dead part must be cut out. The longer you wait, the more tissue dies and the surgery becomes much more complex. It is very painful for the dog. My chow who always rolls over, kept rolling over on his back and squirming but we knew it was not normal and something was up. We did not know what, but felt that this was an emergency. We rushed him into the car and immediately drove to the emergency clinic. It took us about 10 - 15 minutes to get there. Before we arrived, he was laying down and appeared to be dying and had very shallow breathing. I jumped in the back seat and kept talking to him to hang in there. We made it and they had to do emergency surgery. The first procedure was to stick a long needle into his chest to relieve the pressure. We called our regular vet at home and told him what was going on. What should we do? I clearly remember his words. "Now, Is time for heroics". We opted to go for the surgery even though the chances were not good due to some reading that the emergency doctor told us. I do not remember what the reading was for. The doctor was great and Chuffy pulled through. He also told us that he tacked his stomach and it would not happen again. Lucky for us, the vet on call was an expert in torsion surgery. The clinic people were very nice and honest and did not put any pressure on us whatsoever to get surgery. But we will do anything in our power to save our baby. Torsion, or Bloat is an emergency condition. The faster you get them to the vet, the better your chances are. 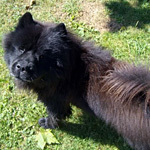 If you suspect this, you must take your chow to the vet or emergency clinic immediately. You absolutely cannot wait. It has been speculated that torsion is caused by dogs bolting their food too fast or drinking water too fast after exercise, but I do not know if this is true or not and there is no scientific proof of this. Other sources say that dogs with larger barrel chests and thinner hips tend to be susceptible to torsion. The vet told us that her stomach twisted really quickly, and that we are very lucky to have gotten her there in time because all of her organs were still ok. However, we were also told that if we didn't get the surgery we would have to euthanize her. NOT AN OPTION FOR US!!!!! She is okay now, and her stomach is now tacked too. I am very glad I knew what to look for. When in doubt bring them in! Do not pass it off as something else, because by the time you realize it's not gas, it may be too late. Everything happens SO quickly. Oh wow, this is a very sad story. I hope none of my dogs ever need emergency check up especially at night, since all pet clinics close at 6 here (no exceptions). I will definately watch out for bloating in my new Chow, thank you for sharing this sad experience. Just a quick couple of cents worth. I have a bloat kit which I bought, but everything that is in it can be bought separately. The kit has a clear plastic 2 feet long piece of 1/2 inch tubing, a block if wood with a hole in it large enough for the tubing to go through (used Tao keep dog's mouth open while putting tube down his thoat, and a large ice-pick type needle with a handle like an actual ice pick. If you ever see the signs of foaming, hard distended stomach and distress, you would put tubing down chow's throat to see if you can clear passage for gas to escape - or if in extreme case, where tube doesn't go down and dog is in deep distress, you jab needle into distended stomach to allow a hole for gas to escape. I don not recommend this as a vet is a much better solution. I just keep it in case of emergency.